No need to fight the crowds and spend money traveling on July 4th. Here are eight fun ways to celebrate without ever leaving your home. The July 4th holiday is right around the corner! 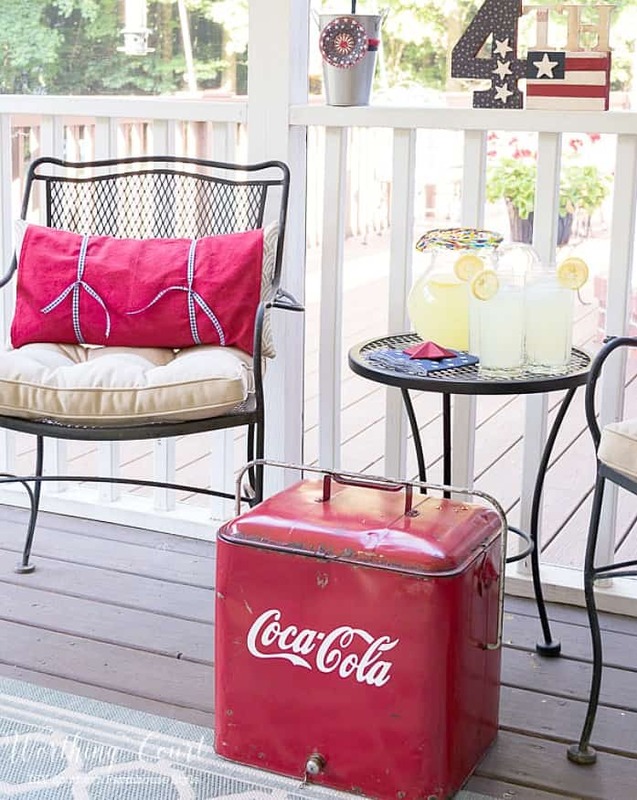 Use these eight ideas for creating a memorable Independence Day celebration in true red, white and blue style! We’re a very patriotic family and love displaying Old Glory on the front of our house year round. But, I love to ramp things up a bit when the patriotic holidays roll around every year. You’ll find me adding red, white and blue decorations to the exterior of my home around mid-May for Memorial Day and they’ll stay up all the way through Independence Day. 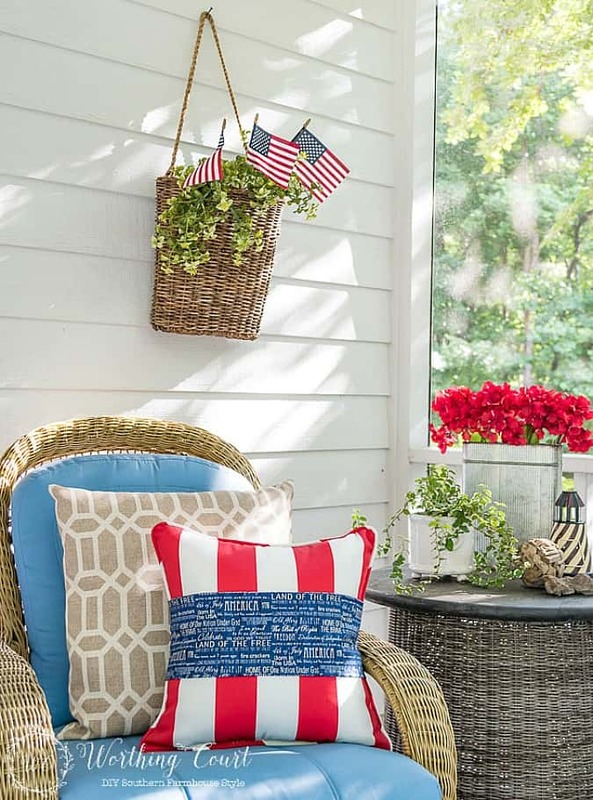 Adding patriotic decor to your home can be as easy as switching up the pillows you have on display. Replace the pillows all together or mix them in with your existing ones. They can be specifically patriotic themed or just pillows that are in patriotic color combinations. I don’t do a lot of crafting, but I do enjoy crafting when I can turn it into a decoration. 😀 Especially when it’s a really easy one! 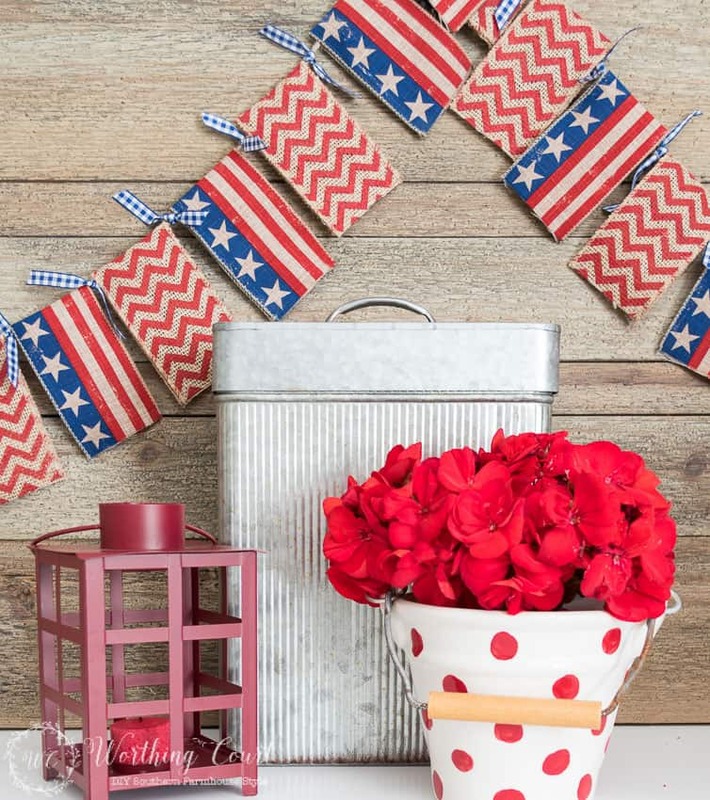 This patriotic garland is amazingly easy and would look great on display at your get together. Click HERE for the how-to. For me, the phrase “vintage Americana”, brings back memories of carefree July 4th celebrations filled with fun, laughter and fireworks. Raid your stash and include any red or blue vintage accessories and add them to your decor for an authentic feel. One thing we can count on here in North Carolina is that July 4th is going to be hot and humid, so a cold glass of icy lemonade is a must for refreshing those parched throats! 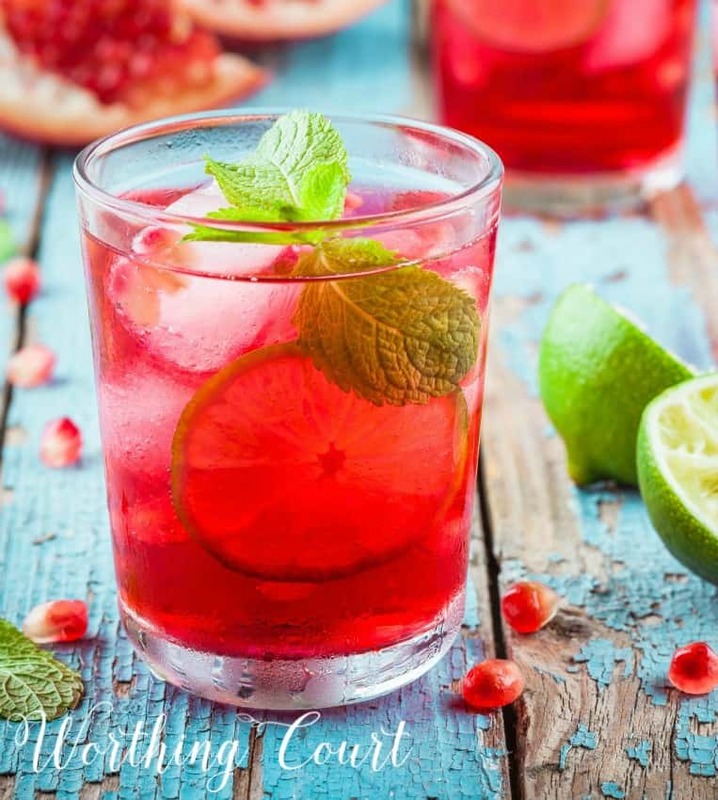 Click HERE to get the two ingredient, 5 minute, low calorie recipe for Pomegranate Lemonade. When you set your table for those yummy burgers coming off of the grill, make sure it’s July 4th worthy. 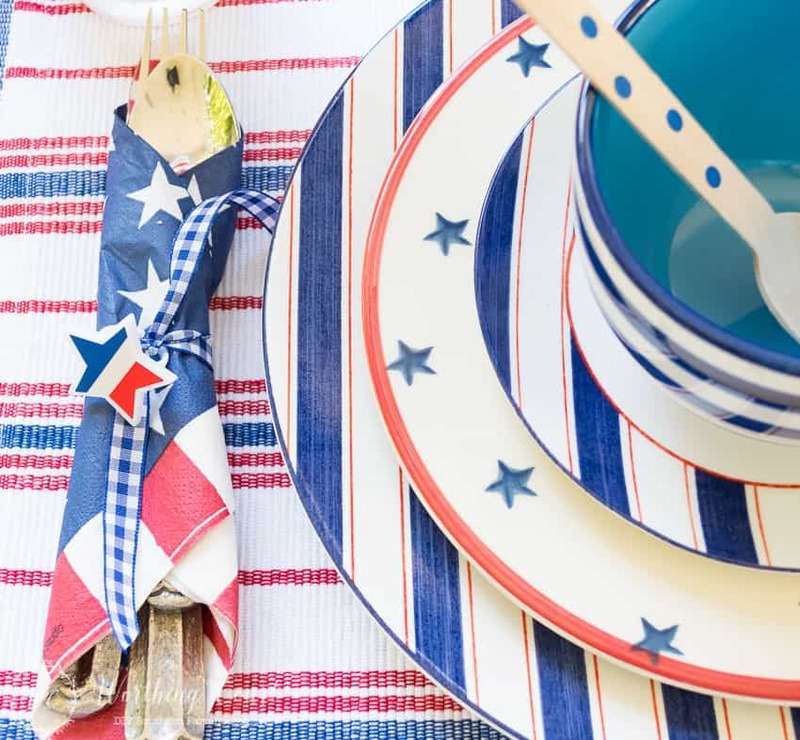 Pick up inexpensive red, white and blue table linens and dishes and mix them all together for a festive setting for your meal. 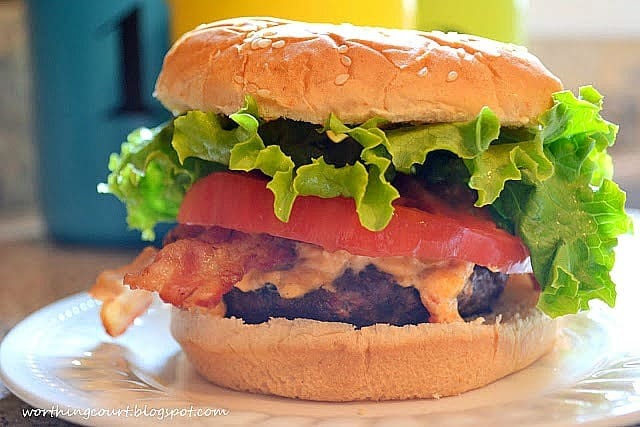 Click HERE to get the recipe for a different take on a classic burger – Pimento Cheese Bacon Burger. 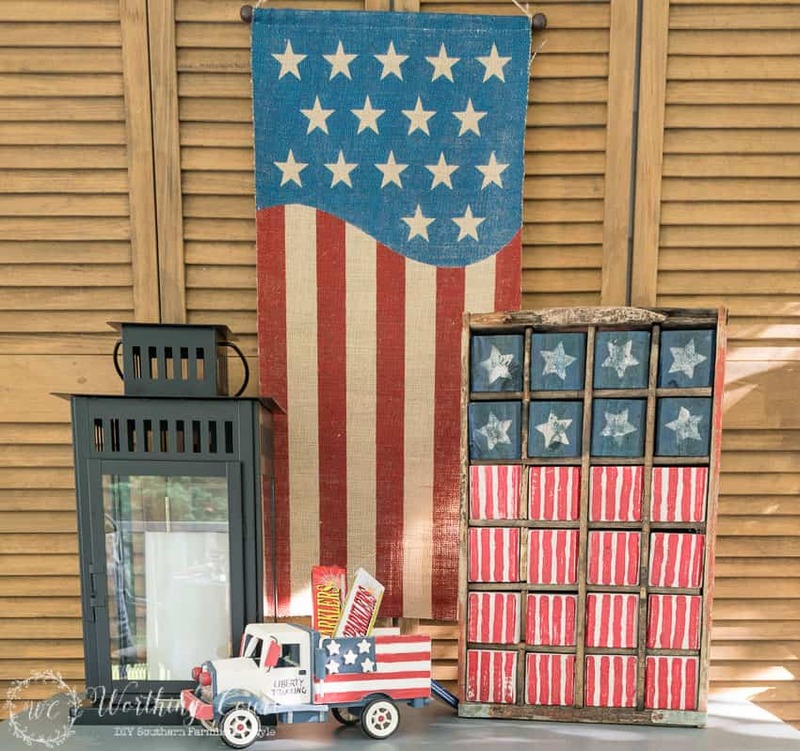 Group a few of your favorite patriotic accessories into vignettes to sprinkle around your home, especially if you’re the one who’s going to be doing the entertaining. Our country’s path to Independence is an amazing story and is one to be cherished! What’s your favorite way to celebrate? Love your home decor! Could you share where you got your wicker porch furniture? Hi Cheryl. Are you referring to the wicker chair with the blue cushions in it? If so, it’s part of a set that I picked up at Walmart years ago. Thanks so much for your quick reply. The cushion color is exactly what I am looking for! I will keep looking. You’re so welcome, Cheryl. Just so you know – the cushions didn’t come that color. They originally were a deep red with a tropical print on them, but I painted them with chalk paint about 3 years ago. It made the fabric a little stiff, but still very comfortable. In terms of durability, the chalk paint is amazing! Two of the chairs have been sitting outside in an unprotected area and the paint looks as good as it did the day that I painted them. That is amazing! I didn’t know you could do that! Thanks for the info. I love your decor for July 4th. 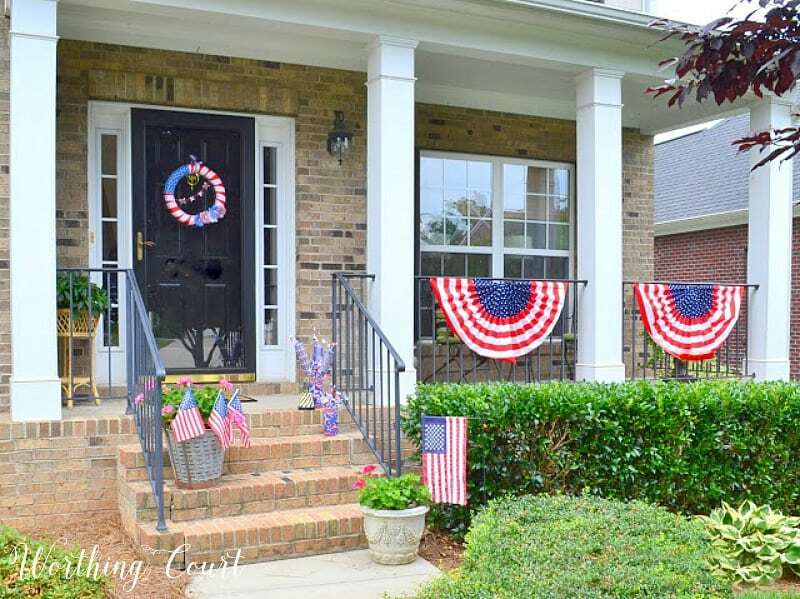 Other than putting a wreath on the door, I never really thought about decorating inside my home for July 4th. Thanks for the great tips! 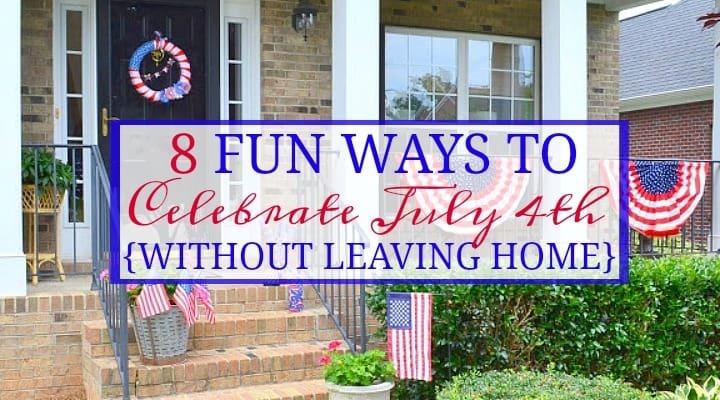 Love all your patriotic decorations and yes, I’m a homebody too! I enjoy the short trips to the Finger Lakes or other NY areas, but the best vacation is a staycation. To be able to enjoy my backyard with family and friends and see the grandkids running around and playing takes me back to a time when my cousins and I would be at my Aunt’s house and playing outside. We didn’t seem to need much to entertain us and we always had so much fun! I want my grandkids to always remember the fun times they had at Nana and Papa’s house. Love the RWB decor, Suzy! Is that red/white striped pillow with the blue printed band available somewhere? Or did you just put the band around it yourself? It’s so refreshing to read a post from another dedicated homebody! We enjoy working in our yard, always updating an area, because home is our favorite place to be. (Fortunately my husband and I are both this way — I can’t imagine if one of us had a travel bug while the other enjoyed relaxing on the porch or deck with a tall iced tea!) We host the large holiday gatherings, as well. We enjoy welcoming family and friends into our cottage-style home and ensuring they are relaxed, entertained and well-fed. Fourth of July is a fun holiday for us, too. I have collected appropriate decor over the years and our front porch just begs for a parade to go by! LOL! Here’s to a Happy Fourth to you!